Controlled access to the facility. Software monitoring and emergency call-out to a single designated phone number. These facilities enable WTS to offer hosting services to our clients across campus. This offers individual departments an alternative to maintaining their own computing facilities. Use of this service may also eliminate the need for departments to purchase and maintain their own hardware. The following explains the various options available. For specific pricing information for all options, please refer to the WTS Services Document. In a situation where you need to maintain your own hardware platform, WTS can house this server for you. This option saves you the work and cost of establishing and maintaining a location that provides the physical security and environmental controls needed to house these critical machines. When preparing to purchase a new server, we welcome the opportunity to review your requirements with you. Based on our experience, in order to maximize the resources available in our machine room and minimize unexpected problems, we have established a standard server model that we can recommend when appropriate. 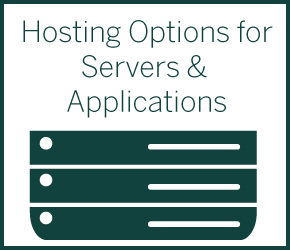 This hosting option is limited to rack mounted equipment only. Request form for hosting a physical server. Using a Virtual Server environment allows the application to live on a shared hardware platform, but is configured to use an independent copy of the operating system. This option is the best choice when the application must be supported by an external group OR the application does not run successfully on the same Operating System with other software applications. The virtual server (often referred to as a "slice") can be updated, restarted and otherwise maintained without impacting the other applications on the same hardware. Specific licensing for database applications will be priced separately. At the time of setup a system administrator must be assigned to the server. This administrator will assume the day to day maintenance of the server regarding patching, user access, etc. in the same way you would administer a physical server. WTS can provide resources to assume this role if needed – please refer to the WTS Services Document for current pricing for this type of support. Request form for acquiring a virtual server.